More than two weeks had passed since the Virginia basketball team last played a game at the John Paul Jones Arena. Maybe the rims were a sight for sore eyes. After all, the Cavaliers made nine of their first 10 shots Monday night and cruised to an 83-45 win against Morgan State. The Hoos are 8-0 this season with one game to go on Sunday against VCU before the annual exam break. 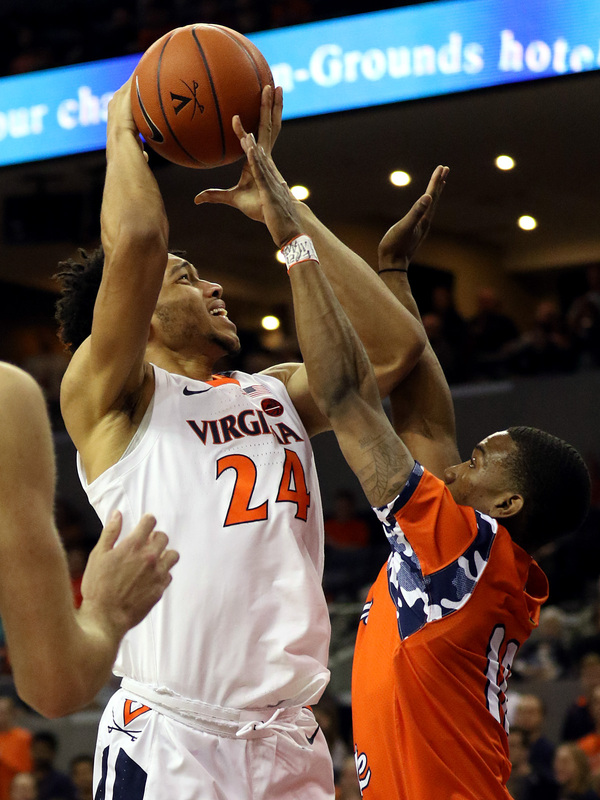 Wide-spread opportunities materialized quickly thanks to the Hoos’ hot start. In the first three minutes, four of the five starters made their first shot attempt to jumpstart the eventual rout. Ty Jerome opened the scoring with a layup, followed by a pair of 3-pointers from Kyle Guy and De’Andre Hunter sandwiched around a bucket for Jack Salt. Those buckets helped Virginia double Morgan State 10-5 right out of the gates. Guy and Jerome added back-to-back 3-pointers before Hunter and Braxton Key each scored on a fastbreak. Finally, Hunter made another triple just ahead of the second media timeout to grow the lead to 23-11. Over those eight minutes, Virginia had not missed inside the arc and the only miss overcall came on a Kihei Clark 3-pointer. The flame-throwing offense didn’t really let up at any point in the first 20 minutes. The Cavaliers ended up with a 65-60-90 set of shooting splits in the first half. They made 15 of 23 shots overall for 65.2% and 7 of 11 3-pointers for a sizzling 63.6% downtown. They also put down 10 of 11 free throws for 90.9%. That all helped the lead balloon to 47-23 by intermission and even though the numbers cooled off from 3-point range in the second half (they went 1-11 and 9.1% after the break), that wasn’t enough to prevent the final 38-point margin. Guy and Hunter led the way with 15 points each, while Kody Stattman added a career-high 9 points. Jerome and Marco Anthony each had 8 points. All 13 players who played scored. That included eight combined points for the green team trio of Jayden Nixon, Grant Kersey, and Austin Katstra. When asked if it was difficult to maintain the intensity in a lopsided game, Guy wasted little time with his response. “It’s very easy, considering how last season ended,” Guy said in reference to the season-ending UMBC loss in the NCAA Tournament. Other than an and-one play for Kersey and a dunk for Katstra that each delighted the Virginia crowd, the play of Key, Anthony. and Stattman stood out among the reserves. Key posted 6 points and 9 rebounds and he was notably active on the glass in the first half. Anthony logged rotation minutes for the second straight game and he continued to look more settled with the playing time. He made a pair of shots and all four of his free throw attempts to reach his season-high total of eight points. He also added eight rebounds, an assist, and a blocked shot in 19 minutes. The sophomore wing said he has tried to focus on staying relaxed when his name is called. Stattman, meanwhile, had made just 2 of 6 shots this season in limited action. He had yet to knock down a 3-pointer, going 0-4 in the first seven games from beyond the arc. For someone used to making shots, that start didn’t go as hoped. His first 3-point attempt Monday night followed the pattern, another near-miss that circled the rim and avoided the net. In the final 40 seconds of the first half, however, Stattman broke through. Jerome delivered an on-target pass to Stattman in the left corner and he swished the shot to get him going on his best scoring night as a Hoo. In addition to those nine points, he had a rebound. 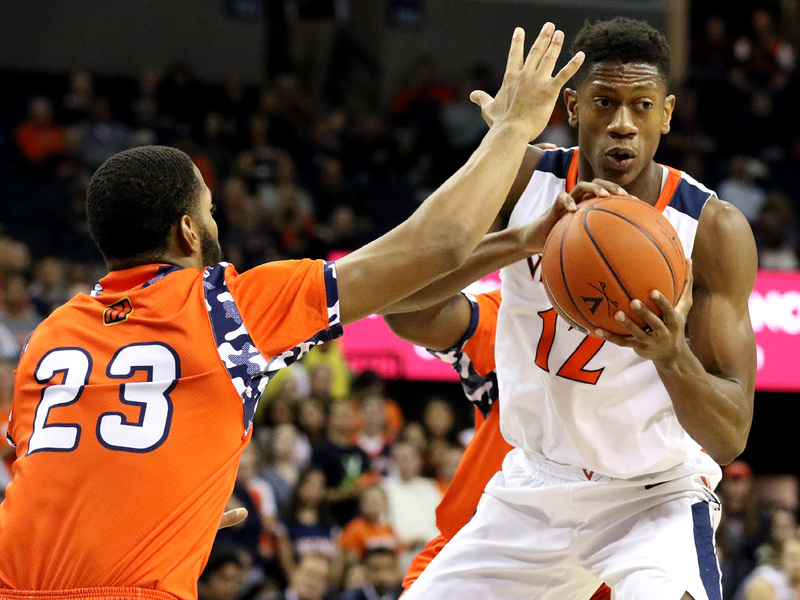 UVA hopes to keep more good feelings going against VCU on Sunday at the JPJ. Tipoff is scheduled for 1:30 p.m.